Whether canola is seeded into tall or short wheat stubble, there is no impact on yield, according to this study. The three-year study measured how crop residue height and the amount of straw on the soil surface influenced the establishment, disease level and yield of canola. Trials were conducted at four sites in 2011 — Swan Lake, MB, Indian Head, SK, Swift Current, SK and Grimshaw, AB. Sites were added at Lethbridge, AB, Falher, AB and Brandon, MB in 2012. Preceding spring wheat stubble was cut at 20 cm (short), 50 cm (tall), and/or harvested with a stripper header. Emergence counts, plant stand counts, final biomass weights and disease assessments were recorded. The study showed no consistent significant effects of standing stubble height on canola emergence, disease pressure or yield at any of the sites. Significant differences were observed between sites and years, but this may be mainly attributed to variations in weather conditions. 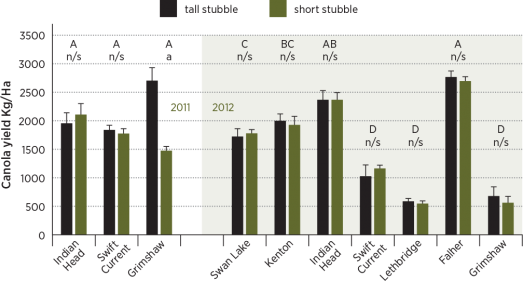 Of the 11 site-years in the study, the only significant stubble treatment effect observed was for Grimshaw in 2011, which had a significantly higher yield in the tall stubble compared to the short stubble treatment. During the 2011 and 2012 growing seasons, standing stubble was lodged over the winter and in spring at some sites. Seeding into tall stubble proved challenging at other sites. These two factors likely contributed to the lack of significant findings. The same study also included a second trial at a couple of Manitoba sites to see if companion crops — crops seeded with the canola — could increase canola yield. At Brandon in 2010 and Morden in 2011 and 2012, hybrid canola was planted at 2 cm and 6 cm depths alone or with a companion crop of canary seed, foxtail millet, camelina or flax. Companion crops were eliminated when the canola crop was at the two-leaf stage. In all site years, canola seeded with Golden German millet at the 2 cm depth had yields equal to planting without a companion crop. When canola was planted with Golden German millet at the 6 cm depth, yields were 12 percent and 15 percent higher in 2010 and 2012 respectively compared to canola planted at the 2 cm depth, but 15 percent lower in 2011. Due to the limited number of site-years included in the current study, it is difficult to make a recommendation, but the data suggests there is potential for further evaluation.